Are you the bravest summoner on the rift? 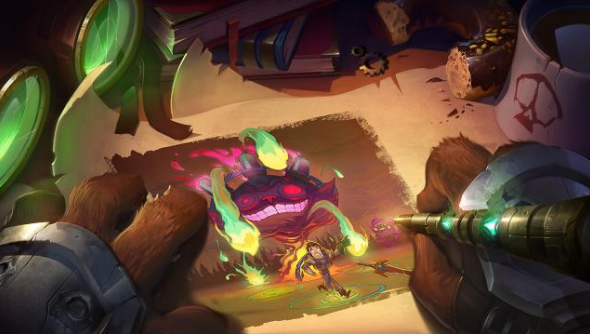 You’ll need to be exactly that if you plan on taking part in Riot’s latest League of Legends experimental Featured Game Mode. The Doom Bots of Doom turns the game’s already tricksy AI champions into fiendish, apocalyptically difficult foes. And they’re stomping their way into battle from July 17th. Gulp. If you’re wondering what makes a Doom Bot so doomy, don’t go heading to Latveria for answers. All the details you need are at the League of Legends blog, but we’re kind enough to warn you about them right here. Imagine, if you will, Amumu with the ability to not just cry himself, but cause all his allies to turn on the waterworks too. Consider this: Zigg’s Mega Inferno Bomb not just detonating on impact, but splitting into six other bombs and exploding in a sextet of fiery death. And if that wasn’t harrowing enough, just consider Lux’s rainbowtastic Final Spark blasting out in not one direction, but every direction. Try and escape that unscathed. Between July 17th and 27th, these Doom bots will be manning the Doom Bots of Doom mode, and fighting them only makes them stronger. As you battle against them you can unlock higher difficulties, allowing the bots to use further Doom abilities. Heading into the mode sounds absolute suicide to me, but then again I can’t hold a lane on my own for longer than five seconds. If you’re into the gaming equivalent of running headfirst into relentless machine gun fire though, simply play League of Legends from tomorrow. Go up against the brutes just a single time and you’ll also bag yourself a special Summoner’s icon.